Spend your Coventry Cash Coupons! Happy 2018 from all your friends in Coventry Village! 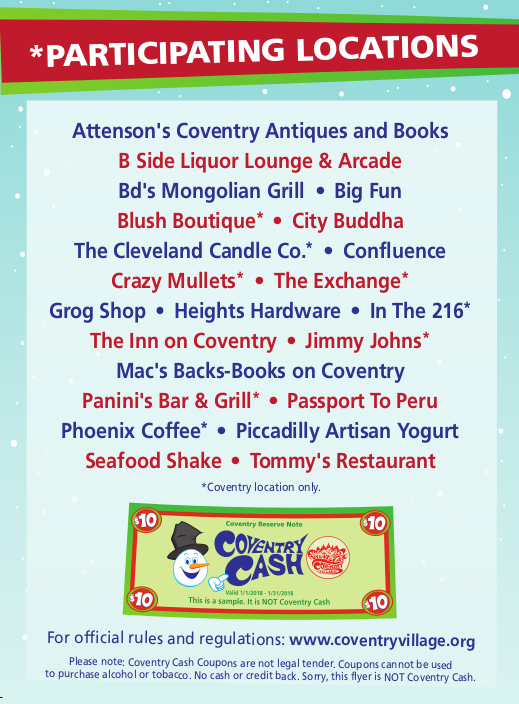 Did you earn Coventry Cash Coupons for purchases made over the holiday season? You can now SPEND IT like cash (though January 31st) at participating Coventry Cash locations. *Coventry Cash Coupons can only be used in participating Coventry Village merchant locations, during the promotional period as printed on the coupon. Purchases made using Coventry Cash must meet or exceed the coupon value. No cash or credit back. Click here for official rules for use.